Miss Brooks tells us about something truly terrifying: Book Week! "You each need to pick a favorite story to share with the class. I want you to wear a costume and tell us about it. 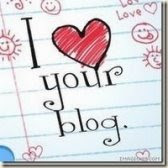 Really show us why you love it!" "I'll never love a book the way you do," I tell Miss Brooks. "Don't be so sure," she says. A circle of anthropomorphic animals have a wide range of interests. "I'd rather be dancing," Emily said. "I wish I was playing soccer," Nicole added. "When can I go paint?" Bitsy asked. Anna said quietly to her friends, "Just as jellybeans come in lots of flavors, there's a book that everyone will like." My favorite booklover will always be Roger Duvoisin's PETUNIA , about a silly goose who learns the hard way that to be smart, you can't just carry a book under your wing...you have to carry it in your heart. But Petunia is no spring chicken on the children's book shelves, and there are recent titles that also celebrate booklovers. For instance! ALFRED ZECTOR, BOOK COLLECTOR by Kelly DiPucchio, illustrated by Maky Pamintuan (Harper, 2010), is a rhyming story about a book collection gone awry a la Sarah Stewart's THE LIBRARY , but with slick and smooth computer illustrations and a waiting-for-animation-feel (6 and up). And we have met Lola in LOLA AT THE LIBRARY before in her perfect celebration of a preschool child's first visit to the library, and in this companion book LOLA LOVES STORIES by Anna McQuinn, illustrated by Rosalind Beardshaw (Charlesbridge, 2010) Lola is finding inspiration for pretend inside the titles she selects (3 and up). In the spirit of dear Miss Brooks Who Loves Books (and so do we), why don't you share your favorite childhood school or public library experience? Ten people who comment (and are reachable) will be selected at random to receive a 2010 Read to Me calendar, generously donated by one of my favorite organizations, The Family Reading Partnership (check out their website for the "Oh Baby!" photo contest to vie for $100 in children's books!). 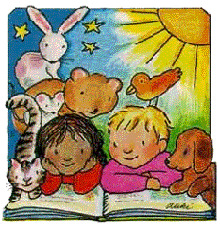 Alas, the year's half over, but there's still time to jot down your daily read-aloud, and the gorgeous artwork of children enjoying books by celebrated children's illustrators (like Aliki, Elisa Kleven, Tomie dePaola, Jesse Watson), are all beautiful and frame-worthy any day of any year! For me, one of my most special memories would be my school librarian reading our seventh grade class THE EGG TREE by Katherine Milhouse, and asking us all to blow eggs at home and bring them in to decorate her own egg tree, overflowing with ovals saved from students throughout her entire teaching career. She let me check out the odd copy of Rousseau in French that had somehow found its way into the grade school collection, no questions asked, although at the time I'm sure it was obvious to her that I couldn't read or understand Rousseau or French. The library was the place where I could pretend to be the fancy person who I wanted to be, the person who knew about beautiful things I didn't always understand...the library was the place where it was safe to not have arrived, but to be becoming. Or maybe my favorite memory was the one time my parents dropped me off for the kids-only preschool storytime in the Chicago Public Library (John Merlo branch), oh, the room was so packed with children from front to back, and where were my parents? Panic mode! Panic mode! But we all got to sit on tidy little mats that we shared with partners, and best of all, at the end of the storytime, the librarian passed out cut-outs that had pictures of animals on both sides that seemed MAGICAL to me for some reason...how did she cut them so nicely? How did she fit a picture of a wild animal on both sides? Obviously, this was a woman of powerful and extraordinary gifts, a woman that made me crane my neck over my shoulder as I left the room. School libraries around the country are currently in terrible peril, on the front lines for cuts and downsizing, despite the obvious and well-documented benefits and the renewed need for capable instructional media professionals in the digital age. These days, sometimes I worry very much that school library programs will go the way of home economics and shop (two other great subjects that help children learn how to do things and create things and not just take tests), and though many have reassured me that the economy will rebound, childhood is short and a lot of experiences can be lost in little time. A generation that goes without is a generation that loses a knowledge and appreciation of what is missing. This is a cause for concern, but also cause for advocacy, invention and intervention. As supporting characters in the reading life stories of our children, let us be inventive of opportunities outside of institutions. Be aware of cuts that are proposed or underway in your area, and be vocal about your opposition...this is one of those times when it's okay to be loud in the library! i was talking to my friend, the scribbler, about the direction my neighborhood library is headed. she said you would have much to say on the subject! we live in a huge district with the tiniest (least revenue generating) library. it is in peril and i am sure, as you said, that there are ways around the institutional system. so i am searching! and hoping that my littles will be able to enjoy the same childhood library experiences i did. What a wonderful sounding book!! This sounds like such fun and one my kids would love. Petunia is a favorite of ours - it has been lovingly read several times, lol. I have such a vivid and beloved memory of our weekly school library trips. It was truly a highlight. The library was close enough for us to walk and there was this brings overlooking a cave that we all made stories up about, featuring a wicked witch that lived in that cave, lol. Once at the library, the children's section was in a room by itself and there was a glassed off area which held window seats and tons of books. After the librarian read us a book, we all got to walk around reading and looking at books ourselves. It was always such a treat to find just the right books to check out and take home to share. From horse books to craft books, it was beyond wonderful!! Saw the wonderful Miss Brooks while browsing recently, and thought of you! 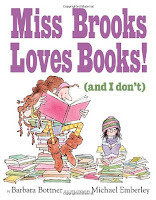 Miss Brooks is on my school book order and I look forward to sharing it this fall! Favorite childhood library story? I don't think I have just one. My grade school didn't have a librarian, but I vividly remember finding, reading, and repeatedly checking out Little Women (still my all time favorite) and Clyde Robert Bulla's The Sword in the Tree. I remember going to the public library and carrying home armloads of books including Nancy Drews and those "Childhood of Young Americans" biographies. Then, there were the trips to the bookmobile with that particular smell of books, kerosene (used to heat the bookmobile) and sweaty little bodies. It was my joy to later be the supervisor of the Bookmobile Department! I have been a rolling stone, so I can safely use the word libraries when I say that there is a severe lack of them in India. School ones were mere formalities with a poor selection and - I don't really recall ever issuing a book. And there were no public libraries in most of the places I have stayed. Yet, in the local club library, there were all the Enid Blyton mystery series which were at my disposal one summer. That was a luxury! We didn't have a lot of space, so I wasn't allowed to buy as many books as I wanted. And still, somehow, before the end of my schooling, I had devoured quite a number of books - so where did they come from if not from libraries, none of which I seem to recall now? 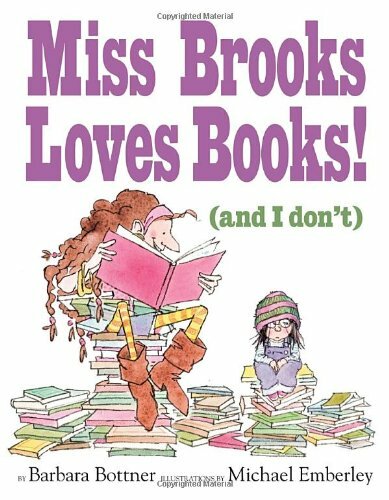 I can't wait to share Miss Brooks Loves Books with my students this year. My favorite library experience is the day when my school librarian had saved some brand new nonfiction books about animals for me. I couldn't believe I'd be the first kid to crack open these books. From that day on I love the feeling of being the first one to open a brand new book. When I first saw "MISS BROOKS LOVES BOOKS (AND I DON'T)" waiting on my cart to be shelved, I immediately put it as a face-out display! As for one of my favorite childhood public library experiences, it would have to be the moment I discovered the DK Eyewitness Books. There was one for EVERY topic I ever wondered about. I could sit in the library for hours and be perfectly content pouring over the Eyewitness books. There were so many facts and so many pictures to keep me entertained and wanting more. To this day, I still adore the DK Eyewitness books!! I can't really remember her name. But I remember we HAD librarians (Army brat ... but apparently I was lucky because I always remember my school having a library and someone always being there) at school. And they helped me find books like Nancy Drew, Trixie Belden, Cherry Ames, etc. All of those series were pretty old when I first read them but I didn't care. I loved them anyway. The library was my very favorite place to be. As a kid I wanted to be a librarian. As a teen and college student it was more teacher. I'm so glad I made it back to my original plan! Thanks for suggesting Miss Brooks loves books; and thanks for your eloquent note about advocacy. My favorite school library memory is checking out the little Beatrix Potter Peter Rabbit series of books over and over again. I loved the way they fit perfectly in my purse and I felt so important and grown up taking them out to turn them in and putting new ones in each visit. Another book I loved to check out over and over again was about a man with a pink umbrella visiting NYC and having a chicken salad sandwich for lunch. I have no idea what it was called.